How could I NOT take the time to discuss Beyoncé’s performance at the Pepsi Super Bowl XLVII half-time show? There were high expectations for this performance, and in my opinion, she lived up to the hype. I feel like it is indisputable what an amazing entertainer she is. AND Kelly and Michelle joined her onstage for a Destiny’s Child reunion? I was screaming all alone in my house and freaking out like I was 12 again (and severely scared my poor pups who were snoozing by my side. They don’t care much for football). Though I must concede to the fact that Bey’s portion alone was a little bit risqué for young viewers, I loved it (plus, I don’t have kids so that’s not really my concern, I guess). It was the performance we expect from her: amazing costume, custom-fit to outline and accentuate every curve of her already-incredible bod, a lot of hair flipping, badass vocals (lip synching or not, we know she has ’em), and killer dance moves. She is mesmerizing. 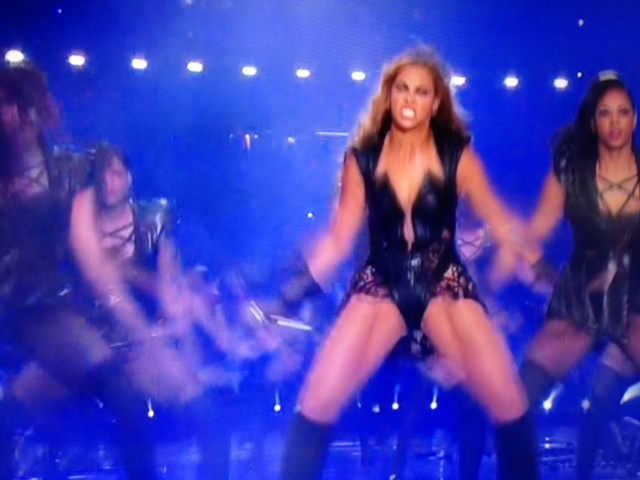 The main thing I would like to point out, something that I think is absolutely necessary, is the fact that Beyonce makes some crazy faces while she performs. Tonight was no exception. Not hating at all. First of all, I love John Mayer. King of melted/distorted face during performances. That’s saying enough there. But really, I love her more for it. It is something I respect greatly. Because that is what happens when you are going 110% and DGAF about anyone else. Go on and do your thing Bey. You give your all. They’re just jealous. I love you.